My father was granted a World War I Homestead in 1938. 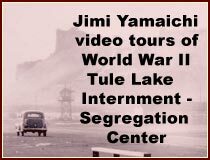 He received 85 acres of prime Tulelake farm ground. After working with horses my father bought his first tractor Farmall F14. Our first potato crop was 1941 and 1943 was the first year I helped my dad harvest the potatoes. My brother had joined U.S. Army Air Corp so I had to work more on the farm. We had a one-row potato digger which I believe was a Case. There was a seat on the digger so I could control both the depth of the digger blade and drop on the rear of digger. It was pulled with a tractor that PTO driven to the digger. One of the jobs was help the potato vines over the digger chain by walking the vines through the digger. We had to start very early in morning so as get enough potatoes dug before the crew arrived. 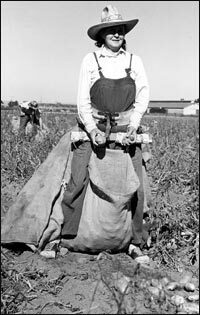 The men used potato belts with sack between their legs and bent over to pick up the potatoes from our windrows that we had dug. Bucking crews would pick up the stub of potato sacks and load on a flat bed truck then unload the sacks by hand into the cellars. It would be late at night when we got done picking up the sacks and dumping them into the cellars. We grew Russet Burbank potatoes the first years without fertilizers because the Tule Lake Basin soil was rich with nitrogen and minerals. We irrigated the potatoes down the rows with gravity water. In the later years more potato varieties has been added. 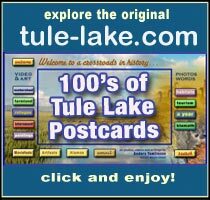 However, Russet Burbanks are still being grown in Tule Lake and Upper Klamath Basins. In the later years varieties have been added. However, there are still growing Russet Burbanks in Tulelake and the Klamath Basin. As the potato industry moved along they advanced to two row diggers, soon they advanced to heavy-duty 2 row diggers built in Shafter, and Edison in California near Bakersfield. Later they had machines that picked up the sacks and one or two people on top dumping the sacks into a hopper and the potatoes went into the truck with a bed with a chain in the bottom so they could convey the potatoes into a piler in the cellars. In the coming years machines came out where they just bulked the potatoes and no sacks or spud belts. Newer and more different machines advanced to today’s big 4 Row Harvesters and much more powerfull tractor and bigger trucks and conveyor/piler equipment and clod eliminators. Today, most the potatoes are newer varieties and many acres of chipper potatoes, plus fresh market potatoes. But there still growing Burbanks too. More new and modern potato storage have been built. There are less growers since 2001 water turn off. However there are larger grower now. ©2014 Lewie Baker, Tule-Lake.com and Anders Tomlinson. All rights reserved by respective writers and photographers.